BrainGain® is a unique all natural oral dietary supplement in a soft gel capsule which may promote harmony in the mind and body. BrainGain® uses an exclusive combination of ingredients, based on published research. BrainGain® has been developed to promote mental sharpness and cognitive function. Unique to Algonot’s family of formulations is olive kernel oil and flavonoids. BrainGain® – to promote brain health, cognitive function and mental sharpness. * 90 count: BrainGain® is a unique all natural oral dietary supplement in a soft gel capsule which may promote harmony in the mind and body. BrainGain® uses an exclusive combination of ingredients, based on published research. 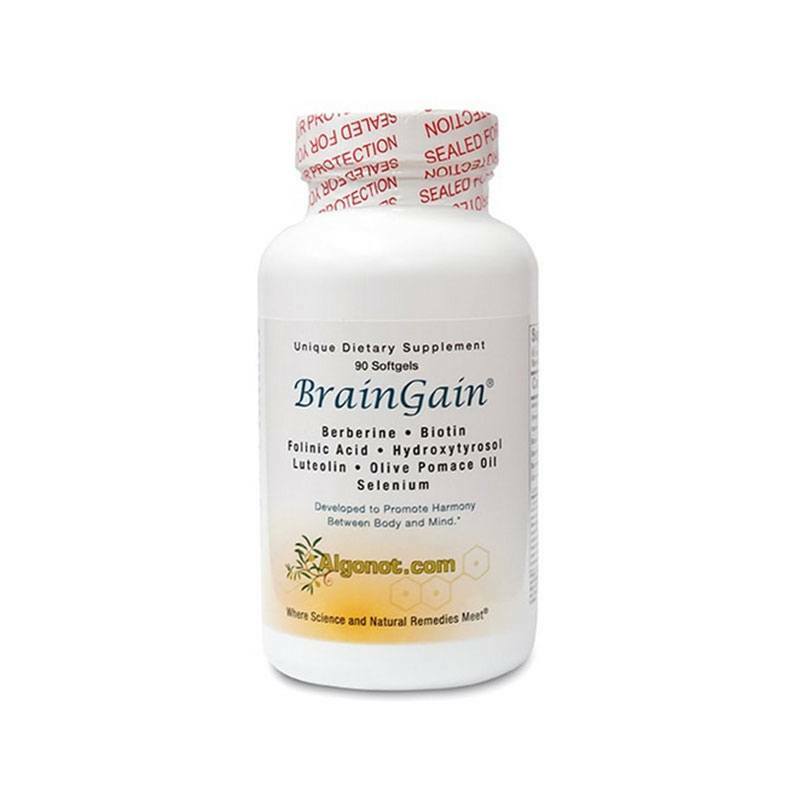 BrainGain® has been developed to promote mental sharpness and cognitive function. * Unique to Algonot’s family of formulations is olive kernel oil and flavonoids. BrainGain® is Free of: Milk or milk by-products, egg or egg by-products, fish or fish by-products, shellfish or shellfish by-products, tree nuts, peanut or peanut by-products, wheat or wheat by-products , soybeans and soy by-products. Berberine – May support , Cognitive Function and Healthy Immune Function. It may also support removal of “bio-film”. Biotin – Also known as Vitamin H, a B-complex vitamin which may support cell growth and proper metabolism of essential fatty acids. Biotin may support healthy function of neurons, gastrointestinal function and may promote a healthy gut flora. Folinic Acid – May support cognitive actions as well as may promote production of cells. Hydroxytyrosol – Considerable evidence shows it may promote cognitive actions as a powerful antioxidant. Luteolin – A naturally occurring molecule known as a flavonoid. An antioxidant that may reduce free radicals. May also promote inhibition of mast cell and microglial activation. Olive Pomace Oil – a powerful anti-oxidant that is instrumental in helping the body absorb and delivery the ingredients found in each soft gel capsule. This unsaturated oil, rich in antioxidants, may promote healthier function. It also substantially increases the absorbability of all ingredients in the Algonot Family of Nutraceuticals. Selenium – May support normal development and protection of brain cells.